Russia believes that the Islamic State terrorist organization is Russia’s main enemy, said Russia’s foreign minister Sergey Lavrov in an interview with Russian radio stations. He also confessed that Moscow had high hopes for US President Barak Obama but since his election there had been a series of wars. Russia’s Foreign Minister on Wednesday gave a detailed interview with Sputnik, Ekho Moskvy and Govorit Moskva (Moscow Speaking) during which he said he considers the extremist Islamist group Islamic State to be Russia’s main enemy. “Our main enemy at present” is the Islamic State, Sergey Lavrov said. “Hundreds of Russian citizens, hundreds of Europeans, hundreds of Americans are fighting for Islamic State, as well as citizens from CIS countries”, said Lavrov, head of Russia’s Ministry of Foreign Affairs. “They are already returning home. They will fight for a bit, then take a break, and then while they are relaxing, for their own entertainment, they can carry out their own beastly acts at home,” he said. Answering questions about possible threats to Russia from China, Lavrov said he believes the only threat to the country’s security is the American missile defence system. “I do not see threats from the Chinese side apart from one; the missile defence system; which is being developed in America, Europe and north-east Asia, which encompasses the perimeters of the Russian Federation,” said Lavrov. Talking about American politics and President (Barack) Obama, Lavrov said that Moscow had held high hopes but, during his presidency, there have been a series of military conflicts. “I wouldn’t want to start talking about personality, but there was a lot of optimism. There was even a Nobel Peace Prize, of course, but following that there has been a lot of war. 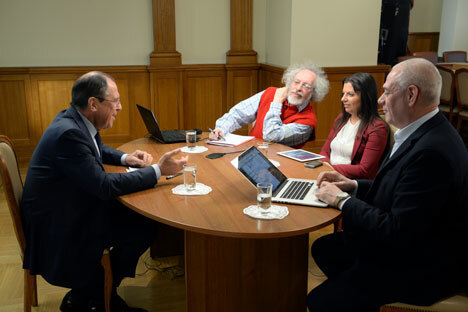 What’s more, the wars have been completely illogical, and have not been in the interests of stability in the respective regions,” Lavrov said. Talking about the possibility of bringing the United States into the “Normandy Format” to resolve the Ukrainian crisis, Lavrov clarified that it was a matter for the French president to determine. According to the minister, the Normandy Format was initiated by the French President, François Hollande and therefore the question of involving Obama in those negotiations would have to be addressed to the French leader. However, Lavrov did say that he was unclear whether negotiations in Minsk in February would have been as successful if Obama had participated in them. Lavrov also gave his view on US aims in the Ukrainian conflict. He said it was important for the US to prevent Russia and the European Union (EU) from extending their partnership, especially the partnership between Moscow and Berlin. “And this is not a guess, I have reliable information,” he added. In order to preserve the country’s unity, the minister advised Ukrainians to “reject the obstinacy relating to the obligatory preservation of a centralized Ukraine, which Ukrainian President Petro Poroshenko and government ministers have talked about. “Reject what is being called Ukrainianization,” Lavrov said. He said Ukraine must remain “neutral, in the military-political sense”. Lavrov was asked about the recent decision by President Vladimir Putin to lift the ban on delivery of S-300 surface to air missiles to Iran. Russia’s foreign minister said that Moscow would carry out delivery of the S-300s as Russia did not want Iran to become the next victim of any illegitimate use of force. After Tehran has received the S-300s, those who harbour thoughts of attacking Iran would think twice, said Lavrov. However, a military alliance between Russia and Iran was unnecessary, he said and is unrealistic. Discussing military cooperation in other areas, the minister stated that Moscow did not intend to locate its nuclear forces overseas. He also did not see any necessity to establish Russian military bases overseas, including in Venezuela, based on the American model. Lavrov was also asked to comment on the official complaint made by the European Commission against gas giant Gazprom for breaching an anti-monopoly legislation which the EU put forth on Wednesday. According to the Russian minister, all of Gazprom’s agreements were in accordance with the legal requirements. Lavrov also said that Russia was prepared to renew the Energy Dialogues with the EU.